Space charge is a concept in which excess electric charge is treated as a continuum of charge distributed over a region of space (either a volume or an area) rather than distinct point-like charges. This model typically applies when charge carriers have been emitted from some region of a solid—the cloud of emitted carriers can form a space charge region if they are sufficiently spread out, or the charged atoms or molecules left behind in the solid can form a space charge region. Space charge usually only occurs in dielectric media (including vacuum) because in a conductive medium the charge tends to be rapidly neutralized or screened. The sign of the space charge can be either negative or positive. This situation is perhaps most familiar in the area near a metal object when it is heated to incandescence in a vacuum. This effect was first observed by Thomas Edison in light bulb filaments, where it is sometimes called the Edison effect, but space charge is a significant phenomenon in many vacuum and solid-state electronic devices. When a metal object is placed in a vacuum and is heated to incandescence, the energy is sufficient to cause electrons to "boil" away from the surface atoms and surround the metal object in a cloud of free electrons. This is called thermionic emission. The resulting cloud is negatively charged, and can be attracted to any nearby positively charged object, thus producing an electric current which passes through the vacuum. Polarization in structures such as water trees. "Water tree" is a name given to a tree-like figure appearing in a water-impregnated polymer insulating cable. It has been suggested that in alternating current (AC) most carriers injected at electrodes during a half of cycle are ejected during the next half cycle, so the net balance of charge on a cycle is practically zero. However, a small fraction of the carriers can be trapped at levels deep enough to retain them when the field is inverted. The amount of charge in AC should increase slower than in direct current (DC) and become observable after longer periods of time. Hetero charge means that the polarity of the space charge is opposite to that of neighboring electrode, and homo charge is the reverse situation. Under high voltage application, a hetero charge near the electrode is expected to reduce the breakdown voltage, whereas a homo charge will increase it. After polarity reversal under ac conditions, the homo charge is converted to hetero space charge. ř = mean electron reflection coefficient. The reflection coefficient can be as low as 0.105 but is usually near 0.5. For Tungsten, (1 - ř)A0 = 0.6 to 1.0 × 106 A m−2 K−2, and φ = 4.52 eV. At 2500 °C, the emission is 28207 A/m2. The emission current as given above is many times greater than that normally collected by the electrodes, except in some pulsed valves such as the cavity magnetron. Most of the electrons emitted by the cathode are driven back to it by the repulsion of the cloud of electrons in its neighborhood. This is called the space charge effect. In the limit of large current densities, J is given by the Child-Langmuir equation below, rather than by the thermionic emission equation above. Space charge is an inherent property of all vacuum tubes. This has at times made life harder or easier for electrical engineers who used tubes in their designs. For example, space charge significantly limited the practical application of triode amplifiers which led to further innovations such as the vacuum tube tetrode. On the other hand, space charge was useful in some tube applications because it generates a negative EMF within the tube's envelope, which could be used to create a negative bias on the tube's grid. Grid bias could also be achieved by using an applied grid voltage in addition to the control voltage. This could improve the engineer's control and fidelity of amplification. It allowed to construct space charge tubes for car radios that required only 6 or 12 volts anode voltage (typical examples were the 6DR8/EBF83, 6GM8/ECC86, 6DS8/ECH83, 6ES6/EF97 and 6ET6/EF98). Space charges can also occur within dielectrics. For example, when gas near a high voltage electrode begins to undergo dielectric breakdown, electrical charges are injected into the region near the electrode, forming space charge regions in the surrounding gas. Space charges can also occur within solid or liquid dielectrics that are stressed by high electric fields. Trapped space charges within solid dielectrics are often a contributing factor leading to dielectric failure within high voltage power cables and capacitors. First proposed by Clement D. Child in 1911, Child's law states that the space-charge limited current (SCLC) in a plane-parallel vacuum diode varies directly as the three-halves power of the anode voltage Va and inversely as the square of the distance d separating the cathode and the anode. is its mass. The equation is also known as the "three-halves power" law and as the Child–Langmuir law. Child originally derived this equation for the case of atomic ions, which have much smaller ratios of their charge to their mass. Irving Langmuir published the application to electron currents in 1913, and extended it to the case of cylindrical cathodes and anodes. Electrons travel ballistically between electrodes (i.e., no scattering). In the interelectrode region, the space charge of any ions is negligible. The electrons have zero velocity at the cathode surface. The assumption of no scattering (ballistic transport) is what makes the predictions of Child–Langmuir Law different from those of Mott–Gurney Law. The latter assumes steady-state drift transport and therefore strong scattering. , the equation is commonly used to characterize charge transport in intrinsic semiconductors. Using the Mott-Gurney law for characterizing amorphous semiconductors, along with semiconductors containing defects and/or non-Ohmic contacts, should however be approached with caution as significant deviations both in the magnitude of the current and the power law dependence with respect to the voltage will be observed. In those cases the Mott-Gurney law can not be readily used for characterization, and other equations which can account for defects and/or non-ideal injection should be used instead. There is only one type of charge carrier present, i.e., only electrons or holes. The material has no intrinsic conductivity, but charges are injected into it from one electrode and captured by the other. , are constant throughout the sample. The current flow is not limited by traps or energetic disorder. The current is not predominantly due to doping. The electric field at the charge-injecting electrode is zero, meaning that the current is governed by drift only. 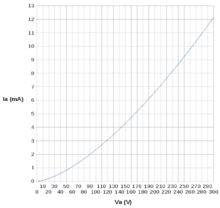 As an application example, the steady-state space-charge-limited current across a piece of intrinsic silicon with a charge-carrier mobility of 1500 cm2/V-s, a dielectric constant of 11.9, an area of 10−8 cm2 and a thickness of 10−4 cm can be calculated by an on line calculator to be 126.4 μA at 3 V. Note that in order for this calculation to be accurate, one must assume all the points listed above. , but increases linearly with the applied voltage. When a very large voltage is applied across the semiconductor, the current can transition into a saturation regime. between the Mott-Gurney law and the equation describing the current in the velocity-saturation regime. In the ballistic case (assuming no collisions), the Mott-Gurney equation takes the form of the more familiar Child-Langmuir law. is the effective density of states of the charge carrier type in the semiconductor. Space charge tends to reduce shot noise. Shot noise results from the random arrivals of discrete charge; the statistical variation in the arrivals produces shot noise. A space charge develops a potential that slows the carriers down. For example, an electron approaching a cloud of other electrons will slow down due to the repulsive force. The slowing carriers also increases the space charge density and resulting potential. In addition, the potential developed by the space charge can reduce the number of carriers emitted. When the space charge limits the current, the random arrivals of the carriers are smoothed out; the reduced variation results in less shot noise. ^ Child, C. D. (1 May 1911). "Discharge From Hot CaO". Physical Review. Series I. 32 (5): 492–511. Bibcode:1911PhRvI..32..492C. doi:10.1103/PhysRevSeriesI.32.492. ^ Mott, Nevill F.; Gurney, R. W. (1940). Electronic Processes in Ionic Crystals, 1st ed. Oxford University Press. ^ Murgatroyd, P. N. J. (1970). "Theory of space-charge-limited current enhanced by Frenkel effect". J. Phys. D. 3: 151. Bibcode:1970JPhD....3..151M. doi:10.1088/0022-3727/3/2/308. ^ Mark, P.; Helfrich, W. (1962). "Space-Charge-Limited Currents in Organic Crystals". Journal of Applied Physics. 33: 205-215. doi:10.1063/1.1728487. ^ de Levie, R.; Seidah, N. G.; Moreira, H. (1972). "Transport of Ions of One Kind through Thin Membranes". J. Membrane Biol. 10: 171. doi:10.1007/BF01867852. ^ van Mensfoort, S.; Coehoorn, R (2008). "Effect of Gaussian Disorder on the Voltage Dependence of the Current Density in Sandwich-Type Devices based on Organic Semiconductors". Physical Review B. 78: 085207(16). Bibcode:2008PhRvB..78h5207V. doi:10.1103/PhysRevB.78.085207. ^ Röhr, J. A.; Kirchartz, T.; Nelson, J. (2017). "On the Correct Interpretation of the Low Voltage Regime in Intrinsic Single-Carrier Devices". Journal of Physics: Condensed Matter. 29: 205901. Bibcode:2017JPCM...29t5901R. doi:10.1088/1361-648X/aa66cc. Coelho, R. (1979), Physics of Dielectrics for the Engineer, Amsterdam: Elsevier Scientific Pub. Co.